By Dr Nathan Grills, Nossal Institute for Global Health, University of Melbourne. The best indicator of effective tobacco control measures is the Big Tobacco scream-o-meter. The more likely an intervention will work, the louder Big Tobacco screams. This year the focus is on plain packaging. Plain packaging is an area that Australians can be proud of. We have led the world in implementing and defending plain packaging. We, as Australians, have stayed the course in the face of vexatious court cases and opposition from Big Tobacco. But the battle for plain packaging is in full fight in other regions of the world. Big Tobacco is redeploying its mammoth forces in low and middle income countries where governments often lack the resources and evidence-based research to fight back against a growing tobacco epidemic they can ill afford. Plain packaging entails removing all branding –colours, imagery, corporate logos and trademarks–and mandates that brand names be in uniform size, font and place on the pack. But plain packaging is far from plain. By removing the brands it makes space for more graphic pictures of rotting limbs, sick kids, dead people and black lungs. The World Health Organization has called on the world to get ready for plain packaging for cigarettes. Video: WHO. This is not a plain intervention but a sophisticated weapon in the war on tobacco; a war in which tobacco will likely be the biggest killer of the 21st century – an estimated 1 billion people, mostly from poorer countries. And plain packaging really works. Simply removing the branding and replacing it with warnings leads to more smokers trying to quit. There is considerable evidence that tobacco companies use the packs as an instrument to advertise and target specific consumers such as youth or women. It is no surprise then that Big Tobacco has screamed very loudly in response to plain packaging. Yet, it has screamed with little effect in all manner of courts, tribunals and trade organisations. Its screams were most recently dismissed by the high court in the UK. More rigorous indicators than the scream-o-meter have been developed by Australian researchers and clearly show that plain packaging is working. There is ever growing evidence that plain packaging decreases the appeal of cigarettes, increases the impact of the graphic health warning, increases quit attempts, decreases the enjoyment of smoking and even decreases actual use of tobacco. Plain packaging is highly effective when implemented in conjunction with other evidence-based tobacco control interventions, such as tax increases and smoking bans in public places. So which countries have followed the Australian lead? The UK, France, Ireland, Canada, New Zealand have most recently Norway have all committed to plain packaging. However, all these are high-income countries where the tobacco companies are sounding the retreat. It is in low and middle income countries, where smoking rates are continuing to rise, that plain packaging is needed most in coming years. In India for example tobacco use is the country’s largest preventable cause of death, accounting for 1.2 million attributable deaths annually. The prevalence of tobacco use is 48% in men and 20% among women, and many more are exposed to second-hand smoke. In India deaths attributable to tobacco are expected to rise to 1.5 million annually by 2020. Tobacco growth markets like India need plain packaging the most. Picture: Nicolas Mirguet/Flickr. So what is being done to meet Big Tobacco’s new front? What research is being done on interventions like plain packaging? There is some early evidence from that plain packaging might be effective in low and middle income countries. A recent study concluded that “plain packaging appears to be successful in reducing appeal of smoking and packets, and supports the call for plain packaging to be widely implemented in conjunction with other tobacco control policies.”However, the study also concludes that there are considerable gaps in the amount of research conducted outside of high-income countries. Why might plain packaging be important in low and middle income countries like India? Every day in India an estimated 5,500 youths start using tobacco. 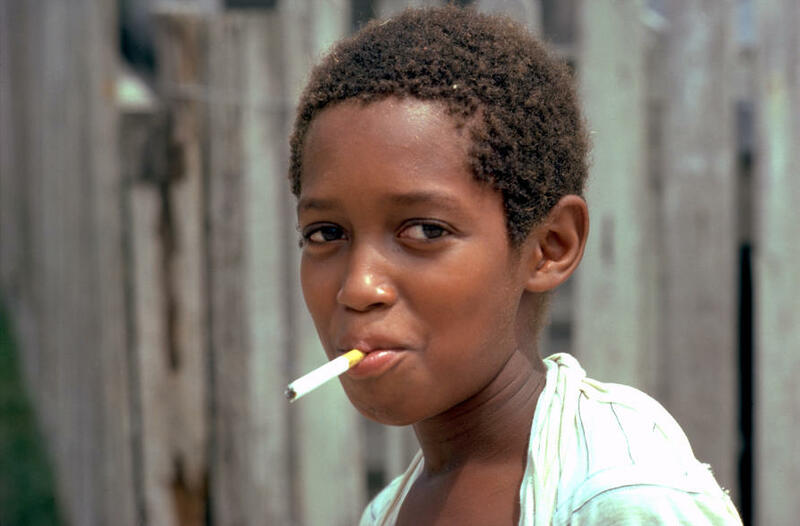 Tobacco advertising, including the use of “attractive” tobacco packaging, has been shown to influence children to take up smoking. Many low and middle income countries have started the battles for tobacco control interventions, including introducing graphic warnings on packs, but with such high numbers of new smokers surely if anywhere needs effective tobacco control interventions like plain packaging, it is India. The Nossal Institute of Global health at the University of Melbourne, supported by Department of Foreign Affairs and Trade and the Australia India Institute, has been working with the Public Health Foundation of India to explore how plain packaging can be implemented in India. Likewise the McCabe Centre for Cancer Research is capitalising on Australia’s success in implementing plain packaging to help other jurisdictions. Plain packaging means the children of the future may not even recognise a cigarette brand. Picture: WHO. India has made significant steps towards plain packaging. Against much industry-supported opposition, strikes and uproar, India has gone ahead with implementing rules that at least 85% of the surface of tobacco packs must now be devoted to graphic warnings. A logical next step is plain packaging. If India were to introduce such progressive laws that would help protect a fifth of the world’s population other low and middle income countries will be emboldened to do the same. These countries can’t afford to be left behind on tobacco controls. The threat to their development is far too great. All of us need to work together to prevent Big Tobacco exploiting and profiting off the world’s poorest. We need to research together, as Australia and India have been doing, to support policy makers to implement evidence-based tobacco control interventions. I want the children whom I work with in India, to be afforded the same protection as my own kids have in Australia. I want them to be protected from powerful mega-companies who wish to promote their dangerous product. Plain packaging will ensure that the children of the future will not even recognise, let alone be attracted to, brands responsible for killing more than 5 million people every year. Research Assistant Nicole Hughes contributed to this article.